Savvy Deets Bridal: Signature Cocktails with Van Gogh Pomegranate Vodka! Signature Cocktails with Van Gogh Pomegranate Vodka! Hello all! It's been a long while since I've shared a cocktail recipe with you, and tonight I have 2 lovely signature recipes that are perfect for your winter time weddings, especially when Valentine's Day is around the corner. Thanks to the good people at Van Gogh Vodka, I was able to sample their Pomegranate Vodka, and try their suggested recipes! So, as you can imagine, I got to tasting, and wow is it divine! By itself, mixed with club soda, and especially in the two following recipes, it is the perfect liquor to have on hand, especially for entertaining! I'm not much of a fruity cocktail gal, sometimes I may go for something sweet, but I like a little bitter than sweet. 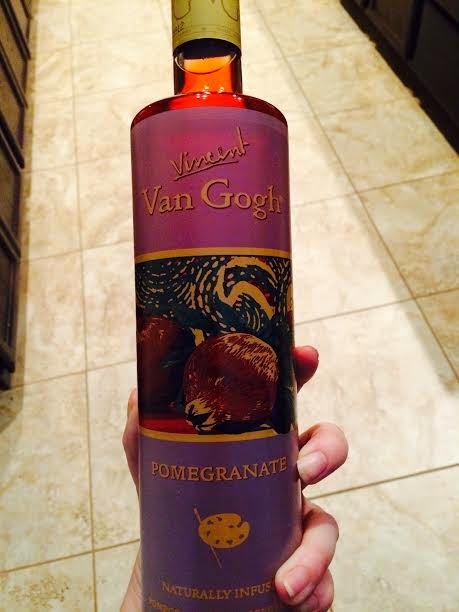 The Van Gogh Pomegranate Vodka is smooth, and while fruity, isn't too sweet, nor does it make your mouth pucker! Also, it is a beautiful red! It is hands down the best thing to serve to your guests, or yourself during these wintry months. See how perfect this would be for your upcoming Wintery Valentine's Day wedding? There are great tips mentioned from Jonathan Pogosh, The Cocktail Guru! Pour ingredients into a rocks glass with ice and stir. Garnish with a lemon wedge. 1/4 ounce honey syrup (equal parts honey and water) Combine ingredients, shake very well with ice and strain over ice into a rocks glass. Garnish with a lime wheel. Both are delightful! Seriously good! The Pomegranate Serenade adds some pucker to the Van Gogh Pomegranate Vodka, but not too much. It's refreshing and is a palette pleaser. The Honey Pom Pom is like a classy martini. I made the honey syrup, which is so super easy to do, and wowy is that a tasty beverage! I love adding in the pomegranate juice, it drives that lovely pomegranate flavor further. The lemon juice and honey syrup rounds it out perfectly! I love that I had to "shake it up" in my kitchen! As mentioned before, this is good to also serve with some club soda, or even some prosecco, as I did this on New Year's Eve! What a delightful bubbly surprise that was! Hopefully this feature of Van Gogh Pomegranate Vodka has inspired you to pick up a bottle, and include it in your winter time gatherings, be it your bridal shower, bachelorette party, or served up as the signature drink at your reception! Let us know if you've tried or will try in the comments below! If you would like to send us your cocktail recipes, please email: info@savvydeetsdesigns.com. Please be sure to include photos, ingredients, and credit. If you'd like to send a sample for us to try, feel free to contact us as well. Thank you Van Gogh Vodka for letting me share your tasty beverage! Disclosure: I did receive the bottle from Van Gogh Vodka to sample and to share the recipes with the readers of this blog. All opinions are 100% my own.